How to Make your Valentine’s Day Extra Special? Valentine’s Day is a time when people show feelings of love, affection and friendship. So on this worldwide occassion, WonderFox comes up with a very special giveaway event with the co-opeartion of Aoao Digital Studio & PearMountainSoft. 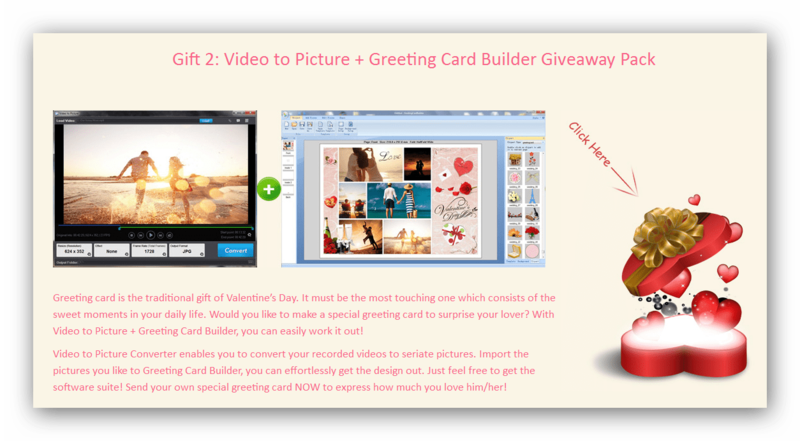 In this giveaway event, just feel free to grab 3 useful products (WonderFox DVD Video Converter + Video to Picture + Greeting Card Builder) and this unique free giveaway will last till February 16th, 2015. So, what are you waiting for guys, just go for it and get the benefit of it. WonderFox DVD Video Converter provides one-stop total solution to rip DVDs (released by Disney, Paramount, Sony, etc), convert video, download online video, edit and play movies/video with excellent performance. It supports the newest NVIDIA CUDA, Intel Quick Sync, multi-core CPUs, batch mode and unique encode technology, which makes the conversion speed 30-50X faster. It adopts Variable Bite rate (VBR) which offers better quality in a smaller file size what’s more it can easily download online video from YouTube, Facebook, Vimeo, Liveleak, Metacafe and other popular video websites. Furthermore, a DVD video player is built-in, which can be used for playing almost all kinds of audio and video files, even DVDs and HD video. Aoao Video to Picture Converter is an easy to use convert video to picture software. You can capture a single picture or seriate pictures from video file. If you want to convert video to pictures, please click button to free download Aoao Video to Picture Converter to evaluate, just three steps to complete video to picture progress. It can convert almost all common video files such as AVI, MPG, MPEG, ASF, WMV, WM, RM, RMVB, VOB, MOV, 3GP, M1V, VOB, DVD to popular graphics formats JPEG, GIF, BMP, TIFF, PNG, TGA, ICO, PCX, PDF, JPEG2000, WBMP, PSD, etc. PearMountainSoft Greeting Card Builder is an extremely easy-to-use digital greeting card software which was specifically designed to create stunning photo greeting card for Birthdays, Anniversaries, Thanksgiving, Christmas, Easter, New Year, Valentine’s Day, or any occasion. The program includes tools for editing cards such as changing the location of elements and changing the size, the ability to crop an image, apply different effects, shadows, frames for pictures, etc. It has an ability to share the cards – you can install the card as wallpaper, send it by e-mail, upload to web, print and much more. For getting everything free, just visit WonderFox Valentine’s Day giveaway page here to download the giveaway cookies what you want or you can download the complete giveaway package. Please remember that the giveaway software does not support upgrade. Thanks to Swizz from WonderFox Soft for informing me about this promo.